Is it time to head in to visit your dentist for a checkup? If so, then how can you get the most out of your preventive care appointment? Your dentist in Zionsville encourages you to ask your hygienist more questions, so that you can learn more about the condition of your oral health. Read on to learn what are some of the best questions you can ask. What Should You Ask Your Dental Hygienist? Medications – While you have your hygienist in front of you, it’s a great time to ask him or her if your charts are up-to-date. You can also help by letting him or her know about any changes or new medications that you’re taking. Improvements – You definitely want to take as much valuable information away from your visit as you can, so it’s suggested that you ask your hygienist if there are any recommendations for what you can do better with your oral health. Changes in Health – It’s equally important to keep a line of communication open between your dentist’s office and your doctor, which involves you acting as the bridge. Therefore, you should ask your dental hygienist if there are any changes in your health, given that he or she can spot warning signs of such conditions as diabetes, heart problems and other maladies by conducting an oral exam. Alarming Conditions – It’s suggested that you ask if there were any strange bumps, sores or bleeding found in your mouth. Usually your dentist and hygienist will bring these to your attention, but it’s always good to take the lead in your oral health. By asking these questions, you are taking an active role in the condition of your oral health. One of the better ways for getting the ball rolling is to visit your Zionsville dentist for preventive care, and while you’re there, don’t forget to ask your hygienist all of the questions you’ve been contemplating. A graduate of the Indiana University School of Dentistry, Dr. Angelo M. Julovich takes pride in providing his patients with the absolute best care. 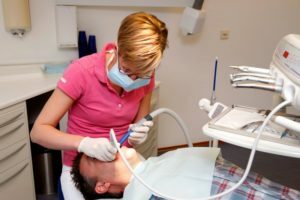 To stay abreast of the latest advancements in the dental field, he maintains memberships in several professional organizations and can be found both educating and caring for patients at Trinity Dental. Dr. Julovich can be reached for more information through his website.